Before I had my serger I'd never bought thread on the cone. Now I have grocery bags full of the stuff! I discovered what many people have known for years, thread on cones is not just to use with the serger! You too can easily save money buying serger thread with the intention of using it on your sewing machine. A disclaimer: the quest for discount thread is only for those who are able to create perfect stitches with their sewing machine. Some people have trouble with less expensive thread, it could be their specific machine or simply the belief that something bad might happen. Whatever the case may be, if tension is still somewhat of a mystery to you, I suggest filing this away for later. I'm also not going to get technical about the thread itself; if you need info on strands, manufacturing techniques, etc., Google is a good resource. In purchasing cones of thread I've noticed a lot of price discrepancy between shopping venues. Discount thread is not usually found at sewing machine dealers. These places seem to have the most expensive of everything, unless you find something on sale. Walmart has a limited selection of cones, and they are inexpensive. I've been to stores all across the US and they all have the same colors: tan, black, white, dark green, red, dark blue, and light blue. These are a great starter set of colors, the thread is of fairly decent quality, and they come on 3000 yard cones. The light blue looks great in the loopers and actually goes with almost anything. I've had luck on Ebay buying either four-color sets or purchasing someone's old box of thread. This photo is a very small representation of what I have. It shows how the cones come in various shapes and sizes. Most of these have around 6000 yard of thread. I noticed that the more commercial thread lots usually come in neutral colors. Shipping is sometimes expensive due to the weight, and it's sometimes a mystery what you may get. Something to watch out for on Ebay is thread size. A lot of what's being sold in lots for industrial sewing and is quite thick. 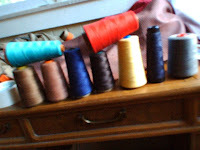 This thread will seem like rope the first time you sew with it and usually requires a bobbin tension adjustment. Some is so thick it will only work in the bobbin! Here's a chart the explains thread sizing. It also explains needle sizes. I've learned that just because you can get the thread through the hole of the needle doesn't mean it will work. You must learn how to use the right size needles too. I've also purchased thread on Craigslist. The cones I got were 16 ounce (around 10,000 yards) and by far the biggest I've ever used. 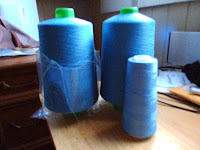 The thread is textured polyester and it works great for many projects. It's a little stiff, but since it's non-twisted it goes through the machine very smoothly. An unexpected source for good discount thread is Asian fabric stores. The store I like has boxes of thread on the floor you must dig though to find for what yo like. All cones are $2 for 6000 yards! 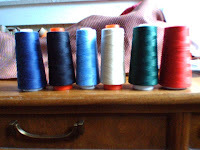 I discovered a technique for judging better quality thread that's similar to choosing fruit at the grocery store. It's what I call my squeeze test. It requires a little understanding of the thread itself. When you look at the best/expensive thread in the light you will notice that it is smooth, with very few fibers coming off a single strand. Being smooth, this thread will feed in your machine easily. The worst quality cheap thread looks like yarn when you hold a strand to the light -- it's fuzzy. The fuzz causes the thread to drag through the machine and produces more lint. When the cones are wound at the factory the thread with less fuzz winds tighter on the cone; the fuzzy thread winds looser. This is where the squeeze test comes in: the better quality thread cones will feel firm when you squeeze them, the lower quality will be more squishy. Another sign of thread quality is how shiny it is, which sometimes correlates to how much fuzz it has. (Not always though because although textured polyester or nylon thread isn't very shiny, it doesn't have fuzz.) Shine is created when light reflects off the thread's surface, more fuzz means the light is diffused, less fuzz means a smoother surface and more light reflection. I never buy regular small spools of thread these days. Usually I'm only doing three-thread serging, so I use my extra thread holder on my serger to hold a cone for my standard machine. The machines are next to each other so I just bring the thread over from the extending thread guide. Works great and very economical! I've just recently been realizing that cones are the much cheaper alternative to the smaller spools. Just found your blog and you have a lot of great info here! Thanks for sharing! Nice! GIANT list of contacts for your automotive seatbelt overrun needs, plus an all new redesigned website at http://rosemonttextiles.com/seatbeltMonster-sized discounts today. Money has been saved and improved for the full efforts of the investors of the country. The arrangement of the things is done for the purpose of the saving of the money by the people for the full use of the tings and all elementary things for the humans.